The Arc Arena II Sport Bouncer is now ready for game time so let the games begin! KidWise is famous for its new and unique activity based bouncers. 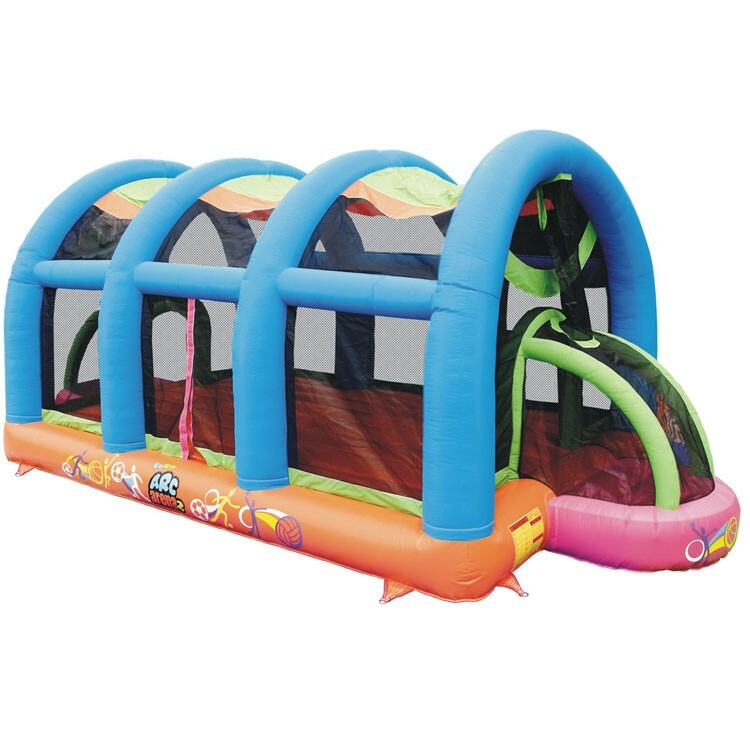 The Arc Arena II has a 28’x13’ overall dimension with lot’s of room inside to Bounce around and Play. Each end has an open goal that can be used for Soccer, while the Hoops above each goal is perfect for a little game of Basketball. The Arc Arena II Sport Bouncer is now ready for game time so let the games begin! KidWise is famous for its new and unique activity based bouncers. The Arc Arena II has a 28' L x 13' W x 11' H overall dimension with lot’s of room inside to Bounce around and Play. Each end has an open goal that can be used for Soccer, while the Hoops above each goal is perfect for a little game of Basketball. The vertical Hoops have a net on the backside to catch balls and hold them in the storage net until you release them back into the bouncer. You can play with any soft lightweight non-abrasive balls. The unit comes with a starter pack of (six) 6”neoprene all purpose balls. Made with a high quality 8 oz PVC material, this unit was made to endure strenuous activity.